Following me dropping my phone and the screen breaking 🙁 I decided to go with the manufacturer’s for the repair, so after calling them and initiating the repair, I sent the phone off never once thinking this would turn into the saga it has. May I start by saying that I have been a user of HTC phones since the HTC S710 back in 2008 and have ensured that my family are also HTC users. I believe the styling HTC put into their products elevates them above the other manufacturers of Android phones. I purchased my latest HTC phone (HTC One M9) in July 2015, paying over £500 to own it outright and not be tied to a contract. I have long been an advocate of owning my phone from day one and not paying for a contract and therefore I have taken great care of all handsets I have owned with each one lasting much longer than the usual contract periods. My previous handset, the HTC One X was 3 years old when I replaced it and it was in pristine condition. The purpose of my explanation here is to demonstrate that as I have actually paid out significant amounts of money to own the phone I take care of them as much as possible. On Monday 13th June, while getting into my car to travel to work, the phone slipped out of my hand and, despite a desperate attempt to juggle and catch it, fell face down onto the road. When I picked it up my worst fears were confirmed – the glass on the right hand side of the screen was damaged. Fortunately the phone was still operational, just slightly unresponsive around where the glass was damaged. As I was on my way to work when the incident occurred I continued to use the phone in its damaged state for the rest of the day. That evening I decided I should really look into getting the screen repaired. 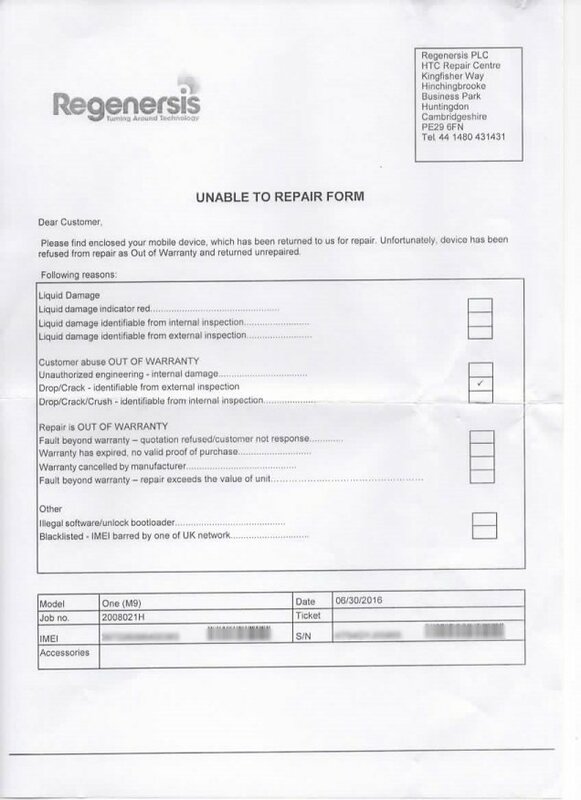 The following day a local shop quoted me £99 plus VAT to replace the LCD and touch screen which I thought was reasonable but, wanting to ensure a thoroughly professional job I contacted HTC to enquire how much it would be for them to undertake the repair. When speaking to the representative I explained what had happened. I made it very clear to him that I had unlocked the bootloader (via the HTC website as I have done with all my phones), S-OFFed, and rooted the phone and was fully aware this voided my warranty. I was not expecting a free repair – just a genuine HTC repair. 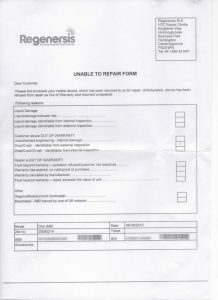 We initiated the return and repair process which entailed him sending out a returns label (addressed to the repair centre – Regenersis – that is based just 8 miles from my location). I returned home that that evening, backed up everything on my phone, removed the SIM and SD card, packaged the phone in the original box and left it at the UPS collection point. 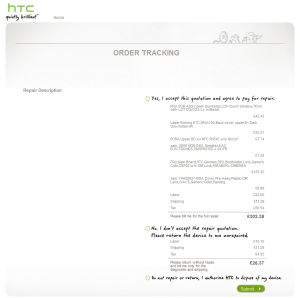 The next morning I logged onto the HTC tracking website using the ticket number (116232739346) and my email address (paul@sneesh.com) to find nothing had happened – my phone was awaiting collection. The same was shown that evening, the next morning and that afternoon – I finally called HTC back fearing my phone had been either lost in the post, or worse still, stolen. I was assured my phone had arrived at the repair centre and was awaiting examination to ascertain repairs costs – indeed, within minutes, the tracking website miraculously showed this. An hour or so later I received an email telling me a quotation was ready to view – I logged in expecting to see a quote along the lines of £150 or so. Imagine my disgust when I saw a cost of £302.38 for this repair. Further to this, I totalled the cost of parts, labour and shipping and got £245.84. Adding VAT at the UK standard rate of 20% gives a maximum of £295.01. HTC’s quote includes VAT at a rate of 23%. Despite numerous calls to HTC I’ve not had a satisfactory response as to why the costs are so high, why they seem to have a VAT rate different to everyone else in the UK and why I am being quoted for items that are quite clearly NOT relevant to replacing a damaged screen. I was eventually contacted by Mr Ian Amon on 21st June 2016 who is an “expert” from the call centre based in the Philippines. He could not grasp the fact that HTC should not be charging a tax rate above the standard UK rate. He also claimed that my unlocking the bootloader and rooting the phone has caused internal damage which is why the mainboard needed replacing. I’m sure you and any other tech-savvy individual will appreciate that rooting the phone merely enables me write-access to the system partition and does nothing physically to the phone. Your expert then insisted that my phone had been exposed to liquid damage. As previously stated at length, I take a great deal of care with my phones and have NEVER allowed it to come into contact with any sort of liquid. 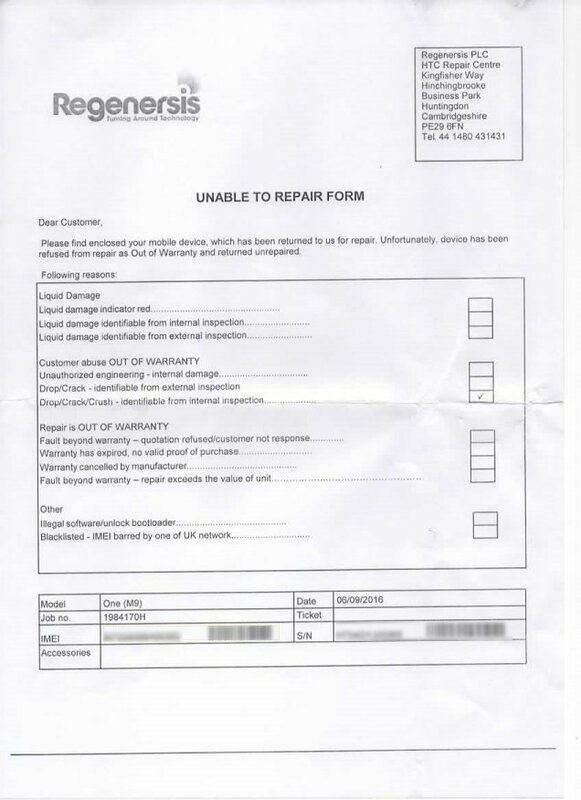 Mr Amon then changed his mind and said that the ‘liquid damage’ could have been caused by the screen breaking causing liquid damage to the mainboard. Firstly, if this is the case, how was I able to continue using the phone for the rest of the day after the screen broke and then perform the backup before packaging it up to be sent to HTC? If the screen break does cause liquid damage then surely this is a major design fault as what should be a simple repair would usually entail almost all new components thus resulting in a practically new phone each time! 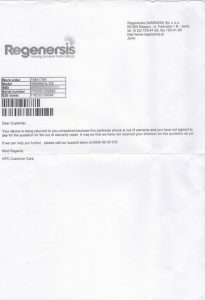 During the call your expert also said that my phone had in fact been sent to Poland to be assessed (despite the returns label being addressed to the diagnostic, repair and data erasure specialists –Regenersis – who are based in Huntingdon which, as I’ve previously indicated, is 8 miles from my home address) and the reason there was a different VAT rate was because of posting / shipping costs to Poland. Even if I decided that I was so disgusted by the behaviour and service from HTC that I wanted my phone back to get it repaired by an independent repair centre I would still be paying more than I should. The option to pay the administration costs and shipping and not have the repair done has a VAT element at a rate of 23%! As I am not prepared to pay an incorrect tax rate which is in excess of the standard UK rate if feels like my phone is being held hostage. Through this entire exercise I have only wanted to have a genuine repair on my phone. 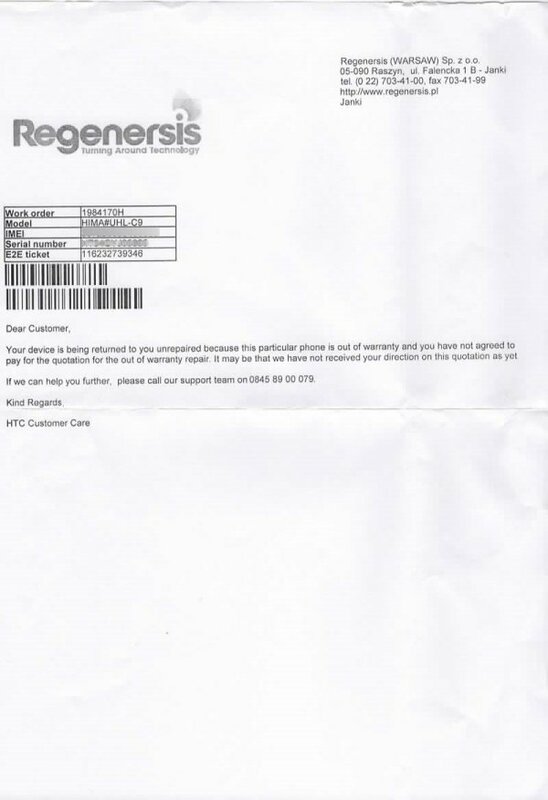 I am thoroughly disgusted and disillusioned by HTC and their extreme lack of customer service and unless HTC are prepared to provide a GENUINE quotation for the work required, I would like my phone returned to me in the same condition as when it was received by Regenersis – i.e. functioning but with reduced response on the damaged screen. I will then seek an alternative repair centre. This return should not be charged at a higher rate of VAT than the standard 20% as used by the rest of the UK. Social media and personal blogs have become very powerful sources for sharing experiences with others and I am absolutely going to share this one. Whilst I’m sure my blog post (sneesh.com) will not be conducive to HTC’s good name, I can assure you any positive response I get from this email will be mentioned, so I hope you feel able to intervene here and try to salvage what has, so far, been a totally unacceptable response from HTC. I look forward to hearing your views on the above. Hello sir, I have been unable to contact a HTC representative in the UK to talk to you about this, but I have been able to get authorisation to release your phone – unrepaired – to you with no charges being made. Do you accept this? I responded that while it sounded like a solution, I would need this offer in email before I would commit myself one way or the other. He assured me I’d have that email within the hour.